Before we get too far into this part of our worship today, it’s important that I take a moment and extend a few greetings. 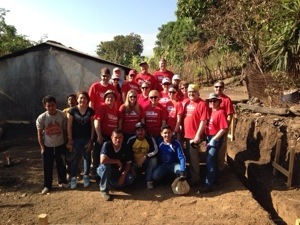 I’ve been away for the past 2 Sundays, traveling with a mission team from Good Shepherd to visit and work alongside our brothers and sisters in Christ in El Salvador. So as I slowly return to life in the United States and all that that entails, I also bring blessings and greetings from Pastor Carlos Najerra and the community of Cristo Rey Lutheran Church in Santa Ana, El Salvador as well as Bishop Gomez, bishop of the Lutheran Synod in El Salvador, and finally from all of our friends who we work so closely with in mission from Habitat for Humanity International and the Global Village of Thrivent Builds. Brothers and sisters of Good Shepherd, our relationship in El Salvador continues to grow and bless the Salvadoran Lutheran church and its families. And I continue to believe quite strongly that our relationships in El Salvador bless you and me as well, as members of Good Shepherd Lutheran Church. Even though we live half a world away in a culture that is a whole lot different than the city streets and rainforest jungles of Central America, in the end, we really aren’t very different. You and I experience times of celebration and struggle with many of the same challenges that the Salvadorans do as we seek to live together as brothers and sisters in the body of Christ. As we live out our life in Christ in community in relationship to one another. So, it’s good to be with you again today and I’m grateful for you prayers and support during this most recent trip. It never ceases to amaze me just how beautiful the body of Christ is. Jesus words today in our gospel reading from Saint Matthew are part of a longer message from Jesus called the Sermon on the Mount. Today we hear Jesus speak of anger and murder; adultery and lust; divorce and oaths. I invite you to take a second and think about the communities in which you live and the relationships that make up those communities – your family, your work, your school, your friends, your church. When you think about them, do Jesus words in this section of the Sermon on the Mount remind you of any of them? So I hope that you and I hear these words from Jesus today not as stinging accusations that give us free access to point fingers of blame and judgment at everyone around us. What I hope and pray that we can hear Jesus saying today, is that our relationships and the communities in which we live matter. They matter not only to you and to me, they also matter to God. On this most recent trip to El Salvador, I was reminded of that during a flight from Houston to San Salvador. I sat next to a middle-aged Salvadoran man who was on his way to a funeral. He has lived in the United States since 1978 when his mother fled to the US with her eleven children during the early days of the Salvadoran civil war. When the civil war ended in 1992, most of his family stayed in the United States and are now US citizens, but a few returned home. They felt like they needed to help rebuild their country in the wake of the horrific war that left tens of thousands of Salvadorans dead, including their own father. The funeral he was attending was for his brother – one of the siblings who had returned to El Salvador following the war. He had been gunned down the day before. Shot 12 times by an unknown gunman while he was sitting on the porch of his house. It may be 22 years since the signing of peace accords that officially ended the civil war in El Salvador, but communities there still struggle to find peace, still hope for relationships to be restored. Communities and relationships that matter. 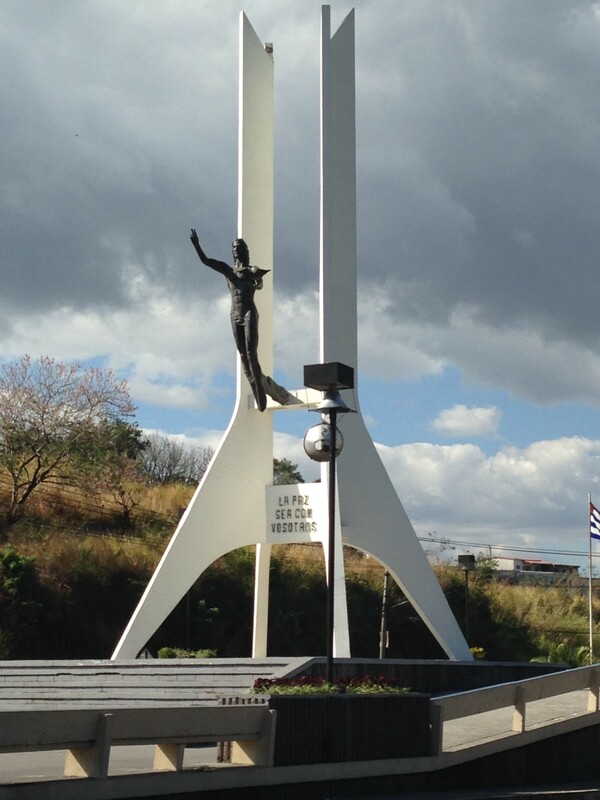 The picture that’s on the screen today is a monument that I’ve seen dozens of times on previous trips to El Salvador, but I don’t think I’ve ever really noticed it before. Think back again to the relationships and communities that are part of your life that matter to you. I imagine many of them bring you great joy and peace. Give thanks to God for them and for the ways that they fill you with God’s love and remind you of the peace that our savior Jesus brings. I also invite you to think about the relationships and communities in your life that matter to you that are not filled with joy today. Weapons of anger or lust or deceit…they seem to flourish without end. Don’t point fingers of judgment or blame – simply hold that community or the people in those relationships in prayer. Pray that God will continue to use both God’s law and God’s gospel to heal and restore the relationships in our lives and the communities in which we live – whether that’s on the streets of San Salvador or Williston or in your own living room. In our church’s devotional Christ in Our Home, Pastor Karen Minnich-Stadler wrote, “Loving God is never meant to be a substitute for the hard work of loving one another. Brothers and sisters in Christ, may you always remember that the relationships in your life and the communities in which you live matter. They will not always be the easiest parts of your life, but they matter – to you, to me, to God. As our flight ended in San Salvador and my Salvadoran brother in Christ and I began our journeys back to the communities and relationships in which we live, I thanked him for the conversation and wished him God’s blessings as his family mourns the death of his brother. He wished me well and thanked me for the work that our congregation would be doing during the week among the poorest of the poor, not just the poor in the eyes of his country, but people who are among the poorest in the world. We exchanged a sign of Christ’s peace to one another and exited the plane, forever grateful for the community we were able to be part of for a few hours on a airplane from Houston to San Salvador. Amen. This entry was posted on Monday, February 17th, 2014 at 1:49 am	and posted in Recent Sermons. You can follow any responses to this entry through the RSS 2.0 feed.